I generally walk out of a pub when I see a sign saying “Karaoke Tonight” (though I did participate and embarrass my daughter on holiday by shouting along to “I did it my way” (which seemed kind of appropriate)). 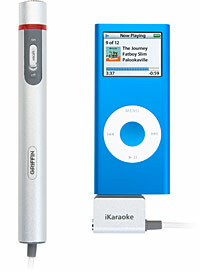 Anyway you can now “enjoy” Karaoke with your favourite music player thanks to the the iKaraoke for your iPod. Other than the fact it encourages Karaoke the iKaraoke is pretty cool. It connects to your iPod in the usual manner and can transmit your warbling voice via FM to the stereo. The clever bit is the removal of the original vocals, it detects which sound waves are the vocals and removes them from the transmission, leaving you to kill the track on your own. The iKaraoke is available from Firebox for £29.95 and I suppose the one consolation is it restricts the pain to the bedroom. I guess it had to happen at some point, but god I hate Karaoke and the people that try and sing but cannot, well if they can sing then yes I do love it but many people cannot…lets hope they do not try this on a train or bus. I think karaoke is the governments answer to binge drinking. now surely this is a good idea just imagine this you get the iKaraoke then you get the ViewSonic iPod Projector put the 2 together and you have a home cinema with karaoke totally awesome comes to mind with this one, i can see this being a major success with all those iPod lovers and even more so for the budding singer. Oops missed it the first time, thanks Fred consider my wrists slapped :). haha thanks Mike, the product is so annoying we covered it 3 times. Wonder who’s going to do the fourth write up :).